A New Way To Combat Malaria Has Dramatically Reduced The Number Of Cases In Some Parts Of Africa : Goats and Soda It's called Seasonal Malaria Chemoprevention. And so far, the results have been remarkable. 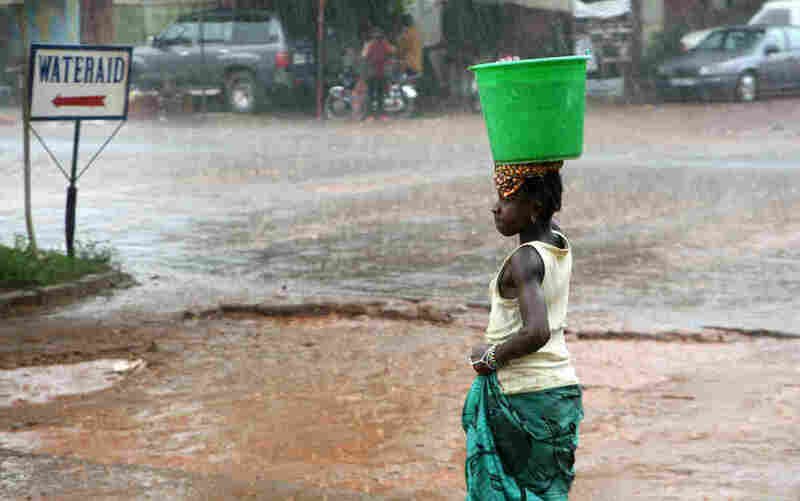 A woman carries a bucket of water on her head on the streets of capital city Bamako during the rainy season in Mali. In Western and Central Africa a new technique to combat malaria is rapidly gaining traction across the Sahel. Health officials in 11 countries are now giving children antimalarial drugs during the rainy season in this semi-arid region and seeing a dramatic drop in the number of malaria cases. The technique is called Seasonal Malaria Chemoprevention. Over four months, health workers give four doses of anti-malaria drugs to children under age 5. And it's been incredibly successful. Studies have shown that this health intervention can reduce the number of malaria cases in some parts of Africa by as much as 75 percent. Issaka Sagara, a researcher from the Malaria Research and Training Center at the University of Bamako in Mali, says this is the first new strategy to show significant impact in the country since the mass distribution of bed nets. "Malaria is the No. 1 disease in Mali," Sagara says. Forty percent of all visits to hospitals and health clinic, he says, are due to malaria. And the majority of the cases happen during the rainy season from August to November. "If you can target this season when the most transmission will be ongoing, then you really can control malaria," Sagara says. Children are more likely to get severe or fatal cases of malaria than adults because their bodies haven't yet built up immunity to the parasites. So Mali and other countries are focusing on the mass distribution of anti-malarials to kids. Pilot studies were so successful that in 2012, the World Health Organization recommended the technique of seasonal doses for millions of children across the Sahel. The antimalarial drugs used in the Sahel are different (and cheaper) than the malaria meds an American tourist would take but the concept is the same — the drugs offer temporary protection against the disease. And Seasonal Malaria Chemoprevention has produced remarkable results. In Senegal it's credited with slashing the number of malaria deaths among children under age 5 by 79 percent, from 2013 to 2014 when the program was introduced. "Now that we don't have a vaccine on hand I would say that this is the most effective strategy we have to control malaria today," Sagara says. The technique is supposed to be a supplement, not a replacement, for bed nets and other malaria control measures. At the American Society of Tropical Medicine and Hygiene's annual meeting this week in Atlanta, Jean Bosco Ouedraogo was showing off the results of research he's doing on the rollout of the Seasonal Malaria Chemoprevention program in Burkina Faso. The program started in parts of Burkina Faso in 2014 and this year expanded across most of the country. Ouedraogo says getting these drugs into every village and making sure kids take them properly is not an easy task. First the health workers have to identify all the children under age 5. "Then we use a door-to-door distribution strategy to give all the drugs to the children during each round of the transmission season," he says. By "each round" he means each month. The kids are given a pill a day for the first three days of the month. The next month the health workers return with three more pills. This goes on for four months. Glitches do occur. Ouedraogo says at times the health workers in Burkina Faso have run out of medicine. "Sometimes there is a difficulty to get them," he says. He says the logistical challenges are being hammered out and he's excited that this new way to fight an old disease could have a lasting impact.